I am privileged to share my journey of UPSC which is inclusive of both struggle and success and I would also say slightly different from many others yet at the same time very similar to a lot of you. 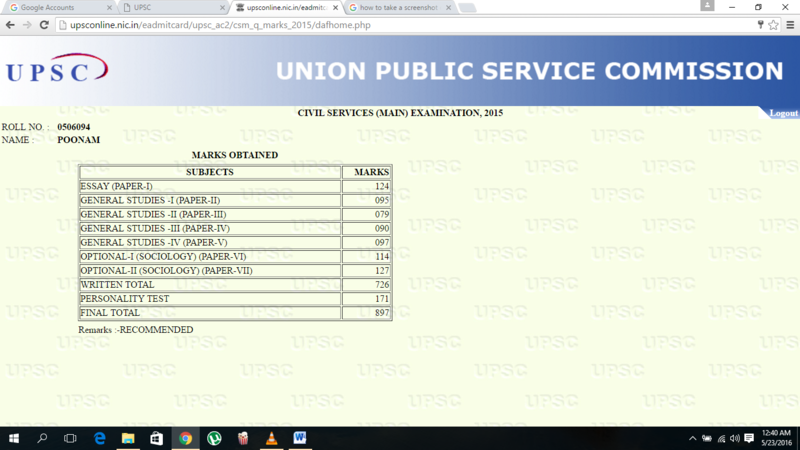 Let me Introduce myself, I am Poonam, Rank 308 CSE 2015, Roll no.0506094. 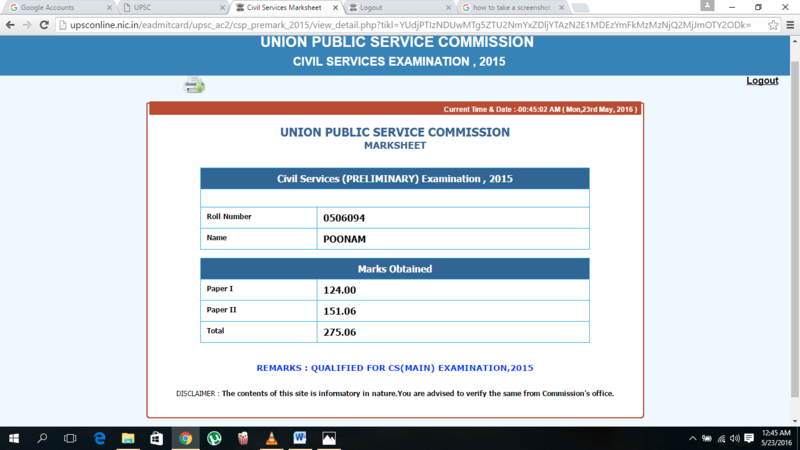 This is my Fourth attempt at UPSC ,Been selected twice in Railways in my previous attempts(CSE 2009 and 2010).My Prelims marks and mains mark sheet are attached. Because of my special circumstances I could study only for 2-3 months for Prelims and for Mains I could hardly get a month before mains (since my baby was born in Sept.) So, could not prepare the whole syllabus nor could study for long time. Whatever little I used to study I concentrated on focusing on the traditional areas like Polity, History, Geography, and my optional Sociology. Also, I used to make notes of certain key areas in every paper for quick reference n revision. other national/international current affairs Newspapers like Hindu and Indian Express,RSTv,InsightsonIndia. General Studies 4: Ethics, Integrity, Case studies Pavan Sir Ethics Class Notes and 2 nd ARC Report and any book on lexicon . Since a lot is dependent on Mains, and considering the lengthy papers I think one need to maintain the speed as I suffered a lot because of lack of speed and time management. In every paper I was not able to maintain speed and thus have to leave 20-30 marks paper unattempted. 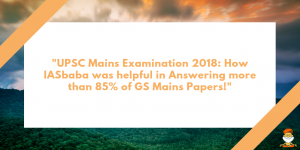 Writing Answers every day is the key to obtain good marks in Mains and I sincerely believe I could have gained at least 40 marks had I done that practice as I would have been much better in my speed and time management. For this, I strongly recommend IASbaba TLP Initiative and InsightsonIndia Secure Initiative on current events. I would like to thank IASbaba for TLP sociology initiative that helped me immensely. Been through this momentous journey of struggle and success ,I would only say have a positive thinking ,take both success and failure in your stride comfortably, learn from your failures but learn more from your success as it allows you to respect the struggle of all those who couldn’t succeed. Thank God, family, friends for their role in your success and support in your failure. Whatever be the case try to move forward in your life, give your best and leave the rest to the almighty. I would only say this is just an exam, Life is a much bigger canvas and it is having both bright and dark shades in it and both have their beauty. Explore Life and yourself. May be you are meant for other bigger things and for doing great things in life one don’t need to be a civil servant only, Being a great human being is enough and that is wat really matters. Wishing you all very best for not only this exam but the greatest examination called life. I hope that reading about my journey can prove to be helpful in any way possible. You can reach me at poonamrandhawasingh@gmail.com. I would love to help you within my limited abilities. IASbaba: Poonam’s life is a lesson for many of you out there. Look back and think!